Nine members of our Lodge attended the District Meeting at the Covington Scottish Rite Temple on Saturday, March 28, 2015. The nine members in attendance qualified the Lodge for this year’s attendance award. Members attending were Bro. Ernie Stratton, P. M., Senior Warden, Bro. Ed Tanner, P. M., Secretary, Bro. Adam Gross, Junior Deacon, Bro. Dennis Stephens, P. M., Senior Steward, Bro. Kenny Williamson, P. M., Junior Steward, Bro. Mel Kinser, P. M., Chaplain, Bro. Rick Campbell, P. M., Tyler, Bro. Garry Kelly, P. M. and Bro. Dan Kemble, P. M.
The Fourth Annual David Wood Memorial Chili Cook-off was bigger and better than ever. Thank you to all of the Brothers from 12 different area Lodges, family, and friends for making the event such a great success. Good food and great fellowship were enjoyed by all. Net proceeds from the Chili Cook-off were $419.79. We also raised $320 for our Kelly Elementary School Christmas Fund. 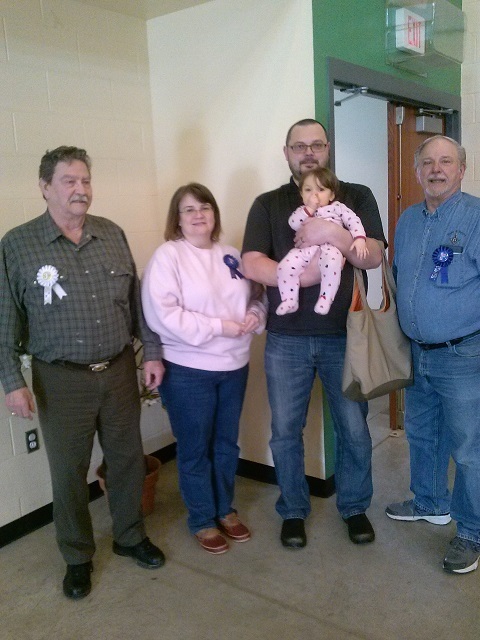 Picture above, left to right: Buddy Wallce, P.M., 3rd place in the traditional category; Laura Rodgers, 1st place in the exotic category and 1st place overall; Adam Gross with Rosslyn Gross, 3rd place in the exotic category; Ed Tanner, P.M., 1st place in the traditional category and 3rd place overall. Not pictured: Holly Kemble, 2nd place in the exotic category and 2nd overall; Travis Bush, Master, P.M., 2nd place in the traditional category. 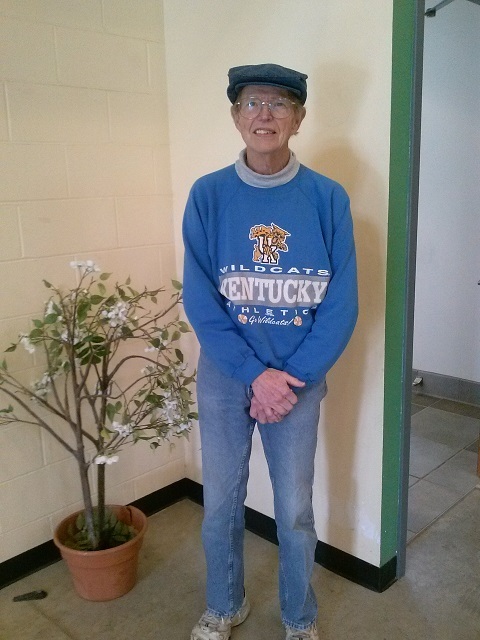 The winner of our Split-the-Pot for the day was Ernie Stratton, P.M., and current Master of Boone-Union No. 304. Brother Ernie invested his winnings in Elvin E. Helms No. 926 Kelly Elementary School Christmas Fund. Help us spread the word about Gracie’s benefit! Click HERE for the official flyer. Print them out, pass them out around town, hang them on community boards, and e-mail them to your friends, family, and co-workers! Newport Lodge No. 358 will be hosting a fundraiser to benefit Gracie Hurst and her family to assist with the extensive costs of her ovarian cancer treatment. Thank you to Cross and Crown Community Church and Pastors Danny and Linda Morgan for calling on us to help this family. Masonry Matters in Newport Kentucky. Let’s keep up the great work Brothers! Other local churches will be pitching in to help out, as well as the German American Citizens’ League of Cincinnati, OH thanks to Chuck Dietz. The fundraiser will be on Saturday May 9th at the Newport Temple. We will have a ham dinner for $10 per person, split the pot, silent auctions, and more. We’re continuing to work on flyers and building a communication web to get the information out. Bookmark this page and check back often for updates! March 4th Update: Contributions from local Lodges are starting to come in. So far we have received donations from Alexandria No. 152, Florence No. 949 and Favorite No. 581. March 6th Update: It is with a very heavy heart that I must report that little Gracie Hurst passed away this morning. Click here to view her obituary. Visitation will be Monday March 9th from 5-9 PM in the gymnasium of the Augusta Independent School. Funeral services will be Tuesday March 10th at 2 PM. Please continue to keep the Hurst family in your prayers. March 7th Update: Generous contributions continue to come in. We have also received donations from Boone-Union No. 304, Augusta No. 80 and Saint Andrews No. 18.